(01-12-2018, 08:17 PM)jgsz Wrote: Frank Etherington's blog mentions 30 + storey condo towers planned for the transit hub. When was that approved? Quote: He (Rich Haldenby) also wants a quality design standard for buildings that will form Kitchener’s future core plus an attractive focal point for the $43-million LRT hub and the 30-plus-storey condo' towers planned at the Victoria and King transit hub. Apparently there might be something planned for behind Shoppers Drug Mart -- I gather around the existing parking lot. Isn't that supposed to be a 17 storey apartment building? I seem to recall a suggestion of that when the site was cleared a couple of years ago. (01-12-2018, 11:22 PM)jeffster Wrote: Apparently there might be something planned for behind Shoppers Drug Mart -- I gather around the existing parking lot. Yes, something to that effect. Amalgamation-related discussion moved to the amalgamation thread. Any mistakes, please blame the tyro MyBB moderator! Apparently the owner, "2407850 Ontario Inc.", of 453 Park St in Kitchener, the medical building that was just demolished at Park and Wood, wants to build a "3-story 30-unit stacked townhouse development." That's a nice density increase, very appropriate for the location. And they should have no trouble finding buyers for the stacked townhouses. I wonder if they'll get any grief about the proposed rear setback? What's behind the site? (01-23-2018, 11:02 AM)panamaniac Wrote: I wonder if they'll get any grief about the proposed rear setback? What's behind the site? The neighbourhood is residential, but the immediate neighbours look like multi-unit buildings with rear parking, so I doubt there are huge concerns. 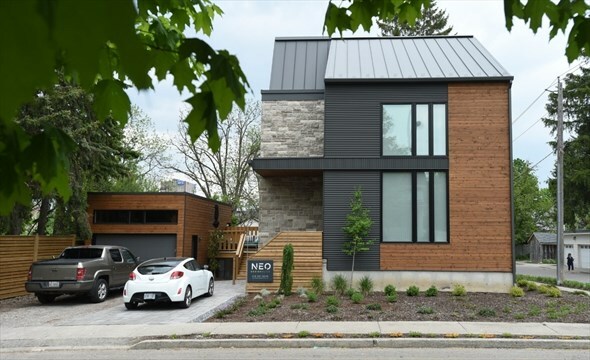 They make some pretty cool contemporary houses that fit well in older neighbourhoods. Where is that one located? I've mentioned in the past that my company (well, the company I work at) will be moving into the main portion of the revamped Schlicters building at 132 Queen. I've just found out that the building was apparently built to be able to hold a 6 story tower on top! This doesn't mean that anything is imminent, and I HIGHLY highly doubt anything would happen for at least 10 years, just thought I'd share that bit of information . We'll also now be taking over even more space than we had initially planned - the vast majority of the building. The second piece of news (which I have received form a source I will not name, but literally could not be any more credible) is that Thalmic is looking at expanding... again. They plan on building an entirely new building from the ground up, in between their 2 existing buildings and connecting them, consuming the parking lots. I don't know the timeline, I just know this is the plan. I don't think the Schlicters building would see and addition on top. If anything it would make way more sense to clear the site and develop from scratch. Interesting to know though! I thought a new build between the two Thalmic buildings was naturally going to happen. Good to hear that they see the potential too. Hopefully they build 4-5 or more storeys to handle future growth! A bit of sad, but leading to relevant news. My old neighbour, whose massive backyard abuts mine (I believe it is 190 ft in length), has been moved to long term care. Her property has been boarded up (165 Courtland Ave E.) which is next to St. Joseph's Residence. This is news as that property allows for medium density, I believe, as part of the Kitchener Official Plan. Property is massive, it runs from Courtland to the end of 189 Cedar St S (our rental prop). It originally was a farmhouse. A bit of history, her father/grandfather (Hintz), owned much of the land that is now present day Cedar St S. In fact, her father helped build 193, 187 then 189 Cedar St S (in that order). 189 was a gift for an uncle that came back from the war (he was originally from Alberta). If you've ever driven down there, you'll see 189 and 193 share a common driveway. The owner of 193 and 189 were one and the same, which was why it was a shared driveway. It has been sold. At present I'm not sure who, but you can believe I am interested, as our property would make the most wonderful 'L' to it. The only issues are GRCA something-or-other for a bit of the backyard (mine as well), and there is a sewer drain on the property. House is in rough shape. It will be demolished. I'm curious who bought it.